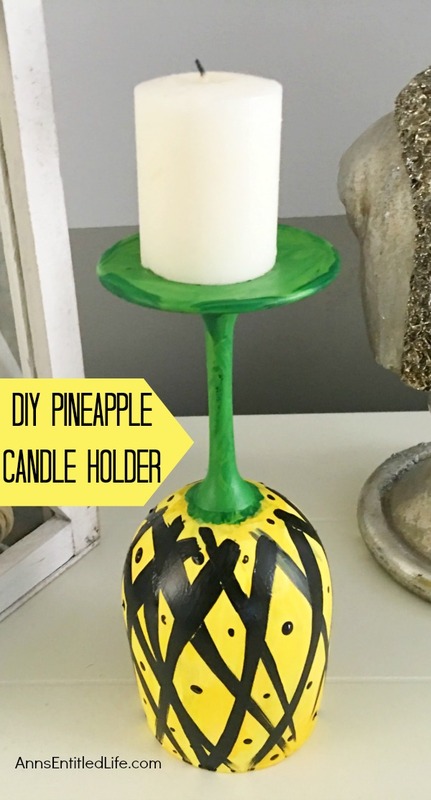 Make your own adorable DIY Pineapple Candle Holder. This step by step tutorial will show you how to easily make pineapples from a wine glass! 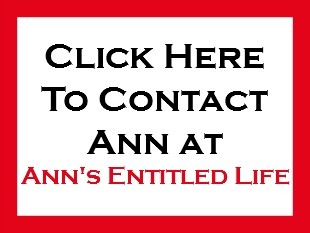 This craft is perfect for a centerpiece, mantel decor or table decorations throughout the year. 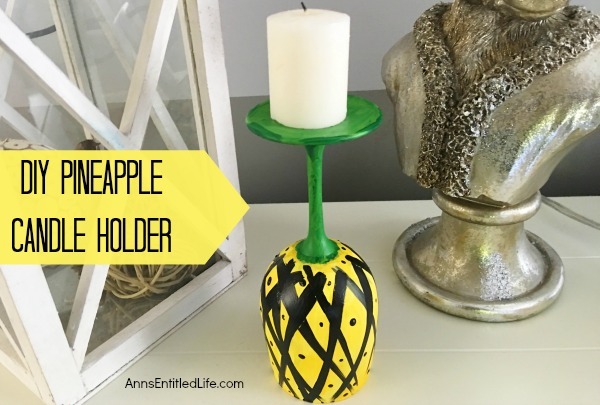 Pineapples symbolized hospitality, so make a few of these and give them as a housewarming gift, bridal shower or birthday present, or just because! If you are looking for a cute craft project, this is it! • Tea light or Votive Candle. Flameless Candles would work really well! 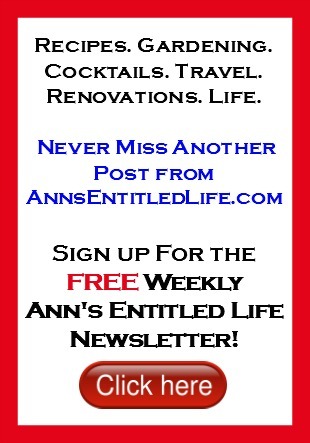 • Squeeze a small puddle of bright yellow and dark green paint on a small easel or paper plate. 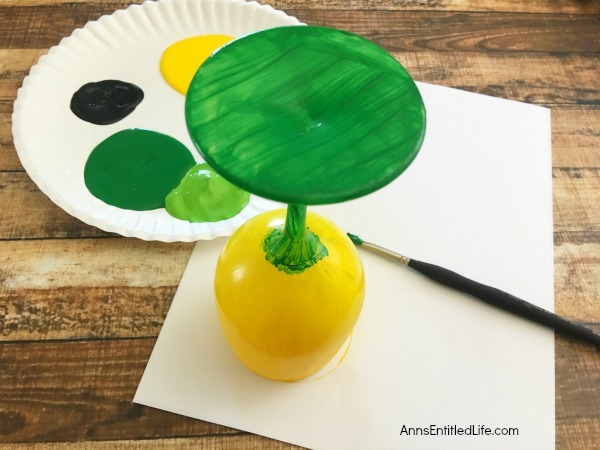 • With a #8 paint brush, paint the bowl and inside of your wine glass with bright yellow paint and let dry (use your hair dryer for quicker dry time). 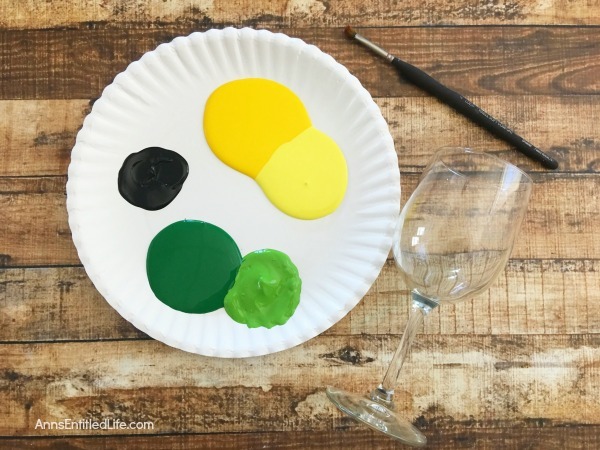 • Paint the stem and base of your wine glass with your dark green paint. • Allow to dry. 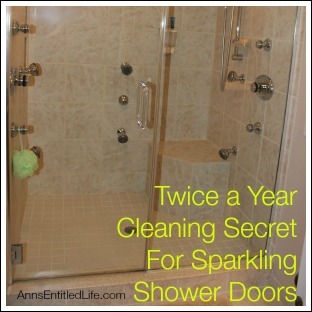 • Once your glass is dry, paint on a second coat of each color repeating the steps above. 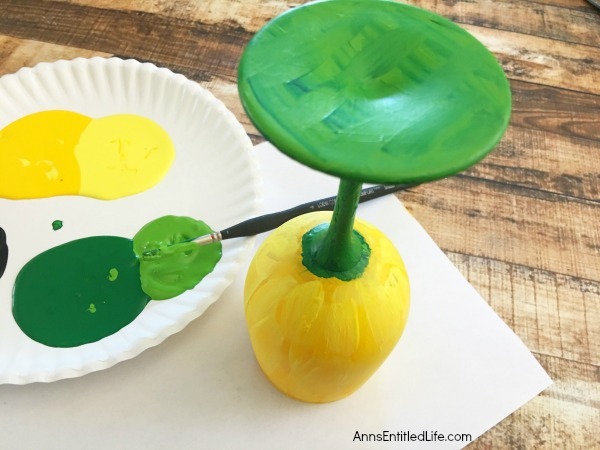 • Squeeze a small puddle of light yellow and bright green paint on a small easel or paper plate. 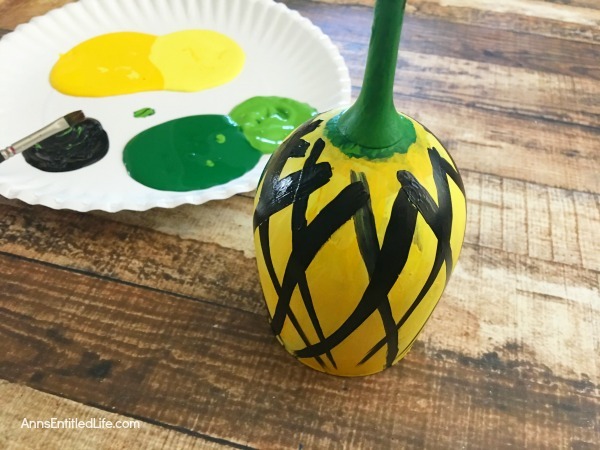 • Now use your lighter yellow paint to paint vertical stripes onto your bright yellow bowl to add a little dimension to the pineapple. 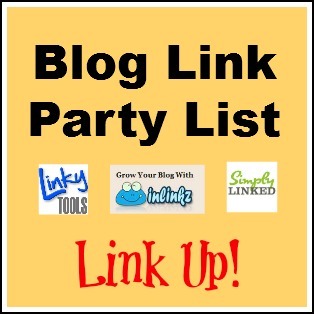 • Use your bright green paint to paint stripes onto your stem. 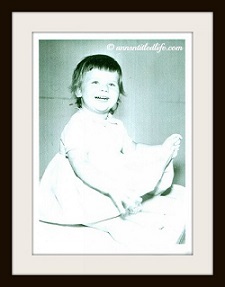 • Squeeze a small puddle of black paint on a small easel or paper plate. • Using black paint and a #2 paint brush, paint diagonal lines crisscrossing each other on the yellow globe of the wine glass over the dried yellow paints. • Now use the end of your paint brush to dip in your black paint and in the center of each quadrilateral that was made with the black crisscrosses (basically a black dot in the middle of each quadrilateral). • Once your glass is dry, place a votive candle on the base of the wine glass and display. This is one easy craft to make! Use more than one wine glass, staggering sizes and heights, to make a beautiful centerpiece you can display year-round. Two pineapple wine glasses would look great on a mantel. These are simply adorable, and definitely attract attention. 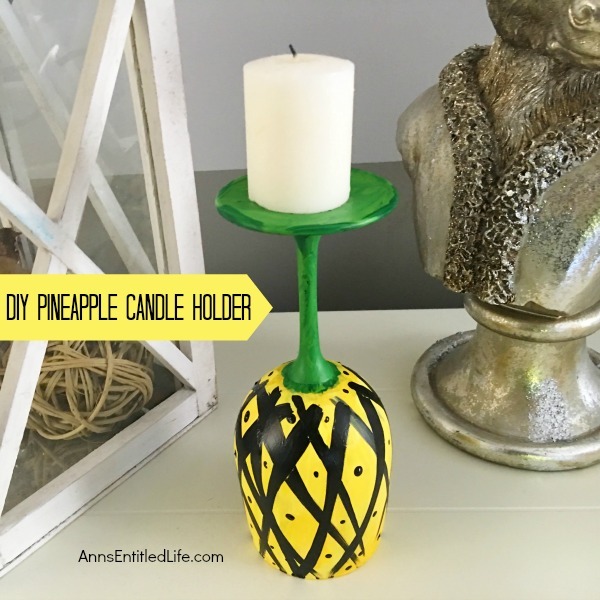 • To print the DIY Pineapple Candle Holder instructions, click here.